Meet the demon of death! This 22 inch Flapping Gargoyle gives a long speech about his evil ways and flaps his wings when he hears a noise or when his buttons is pushed. This decoration contain LED lights and needs 4 "AA" batteries to operate. This is one amusing decoration that your guests will get a kick out of! Remember the story of the bride that not only ate her groom, but the entire wedding party? Yeah that was one hungry lady! This Animated Cannibal Bride will be the perfect addition to your spooky scene. Your visitors will be terrified of this animated specter! Do you consider yourself a cat person? Let this Animated Cat be the ultimate test. This cat hasn't let anyone pet it in a decade or more. Basically, if this cat sees you it will hiss and screech. It's motion activated and the eyes gleam an eerie red. You've been warned! 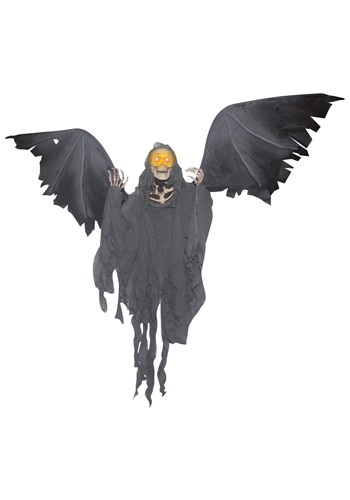 This animated flying reaper decoration is ready to greet your guests this Halloween! This isn't just any reaper, this one has large wings, glowing eyes and is ready to haunt your home. Good gargoyle or bad gargoyle? It depends. Some days he can be sweet and flutter on your shoulder. Other days, he'll perch in the corner of the room and cackle at you all day from afar. This Animated Gargoyle is the perfect prop for your dungeon. This guy just can't rest. 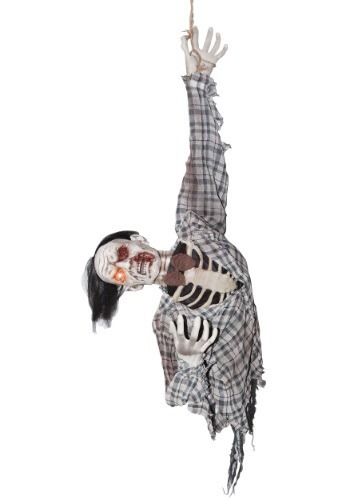 Add this animated ghoul torso to you Halloween decor for a real terrifying experience! Just a word to the wise: do not go up to Hank the zombie and ask him 'how's it hanging?' He absolutely hates it. He has heard it countless times and he doesn't find it very funny. He will try to swing to you and bite your nose off if you do ask him the forbidden question. You have been warned! He's not dead just quite yet! This Animated Hangman with Kicking Legs has a rope noose around his neck. He can be hung up indoors or outdoor using this rope. When the motion sensor is activated, the animated hangman laughs, cackles, and moves back and forth while kicking his posable legs in either direction. 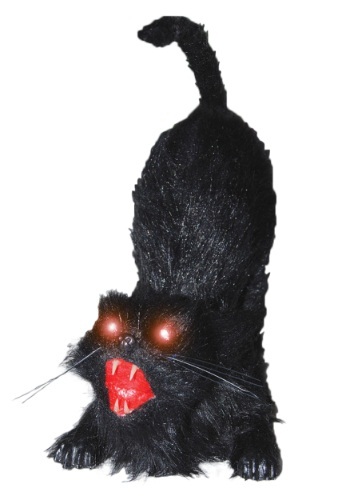 This decoration is great for parties, haunted houses, and graveyard scenes! This bride might have to wait a while for her groom--he may not want to show up because of what she's going to do to him when he arrives! (Or maybe he'll have to show up, because of what she'll do to him if he doesn't!) Either way, this Animated Slashing Bride w/ Knife is a force to be reckoned with. Make sure her day is exactly the way she wants it--or else! Scarecrows usually aren't usually that scary to people. That is, until they light up and move their head! This Animated Scarecrow might be come to life, or it might just be a prop. You'll know the truth, but your visitors won't! So you went all out with your party decorations. The kids loved it, and the adults all thought it was cool. But that was before you flipped the switches on your animatronics! That, friend, is the way to ensure that your spooky scene goes into the Halloween hall of fame. Terrify the little ones in search of treats or take your adult party to a whole new level when you set up this animated ghoul torso. It's the perfect way to turn your humble abode into a terrifying lair! Just imagine. You go the the playground just wanting to have a pleasant swing. But the swing set is occupied. By this scary Leg Kicking Clown on Swing. You decide that maybe you'll come back tomorrow. If he can do that to you on a sunny afternoon, imagine what he'll do to your guests on a dark Halloween night! Oh no! This crazy witch ran into a tree and now she can't get out. Will you help her out? She doesn't bite...much! Hang this Leg Kicking Witch w/ Broom and you can hear her cackle and crack jokes at the passing trick or treaters. 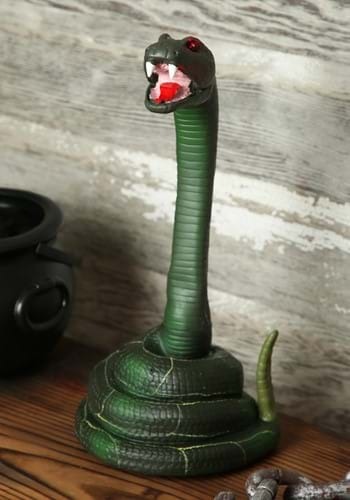 This is a cute and funny decoration that looks great inside a haunted house! You might have though the Wicked Witch was bad but this witch is way worse. In fact, she now has the title "Wickedest Witch!" This Life-Size Animated Flying Witch has green eyes that light up and her head turns from side to side. She is sound activated so she's always listening to every word you whisper. Her cackle is wild and she speaks a few creepy phrases. Trust us, you will want this witch watching over your household. She'll scare away any trespassers! If you didn't already have ophidiophobia before seeing this Striking Snake, you will afterward! This realistic prop looks & sounds just like a rattlesnake as it strikes its prey. 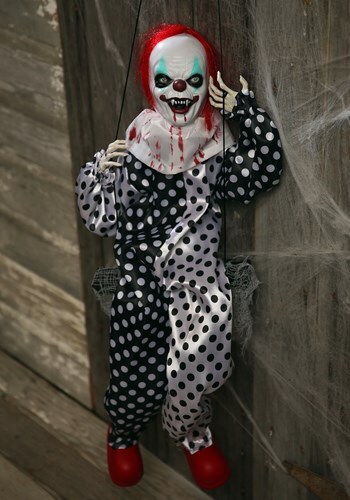 It's battery-operated & motion-activated, and will frighten your guests when they least expect it.